A great feature from Tago platform is its native sharing capability for data and dashboards. 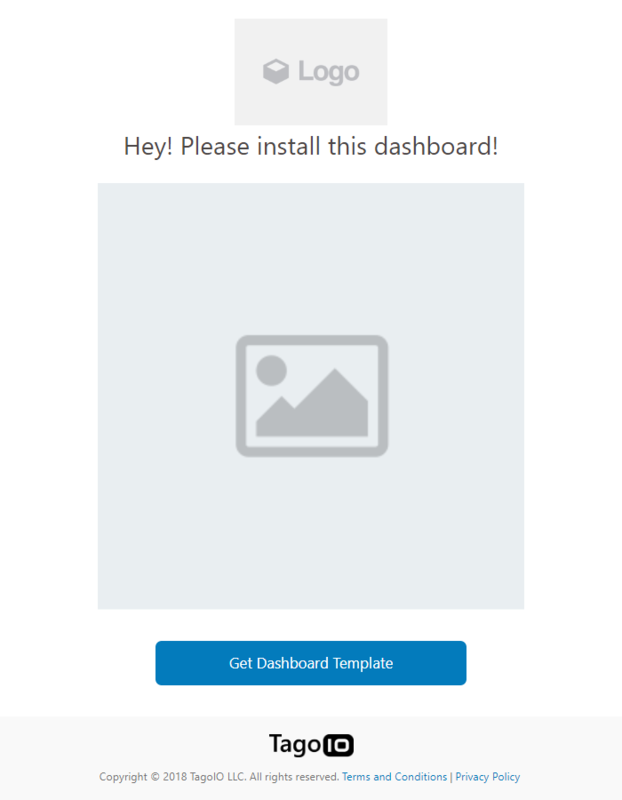 We know that sometimes a dashboard can become an entire feature that you want to share. 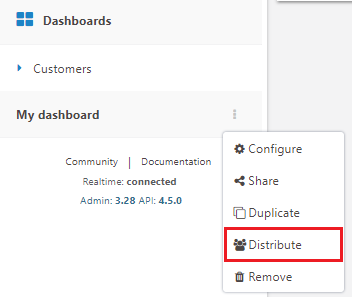 There are two ways of sharing a dashboard with another users: Sharing or Distributing dashboards. If you built your dashboard or have permission from the users who shared it with you, you can share it with anyone using one of these options: Private or Public. Keep in mind: in either option others will NOT be able to move, resize, or even edit the dashboard. 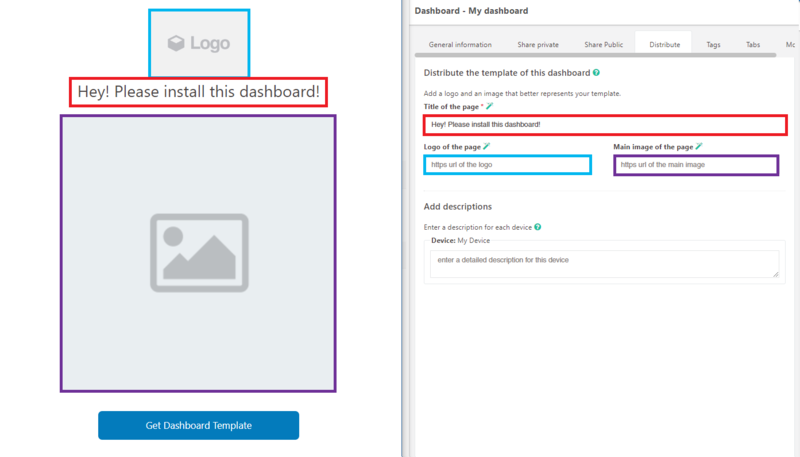 Users can share your dashboard further with others only if you give such permission. You should define if the sharing will expire and when. If you want to share it privately, select the Share Private, and enter the email of whom you want to share your dashboard with. Users who don't have a Tago account will be automatically invited to create one. In that screen you can also visualize the list of users who already can access the dashboards that you shared and what kind of permission you gave to them. From there, you can also stop sharing your dashboard with specific users. You can opt for Share Public your dashboard with anyone that receives an URL link. It will not be necessary for the other users to have an account at Tago. Just make sure you generate the URL and send the link to them. Notice that only one link by dashboard is created . If you generate a new URL, the old one will no longer work. You will need to send the new link to those you want to access your dashboard. 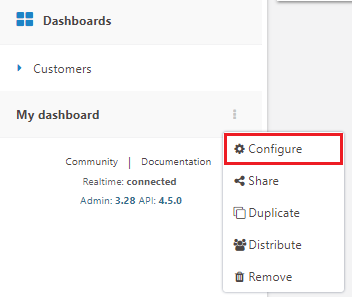 Besides sharing, you can also create a copy of your dashboard without any of your data and send a link to anyone to add a copy to their account through a customized install page. They will be able to modify the dashboards as they wish without affecting your own dashboard. Others will be able to edit the dashboards that they received without impacting yours. When people access the link sent by you, they will see the screen shown below. Keep in mind the images and texts are all customizable. 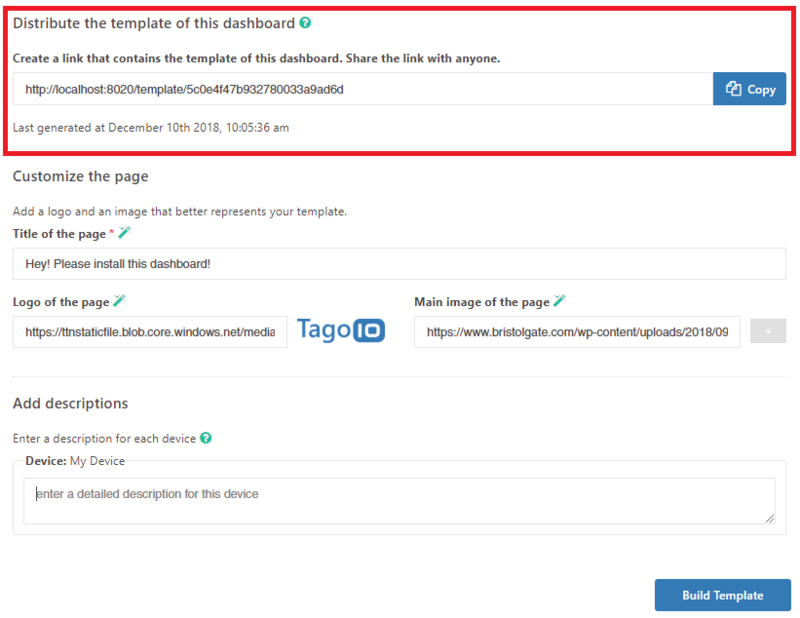 The Distribute function relies in creating a customized install page for anyone to install a copy of your dashboard, and so, in order to create a customized page just the way you want it, Tago offers the possibility to modify the images and the title of the page. At the bottom of the page, there is a section for you to describe your devices. This section exists in order to help whomever receives a copy of this dashboard to associate the expected devices of this dashboard to the ones that they have. 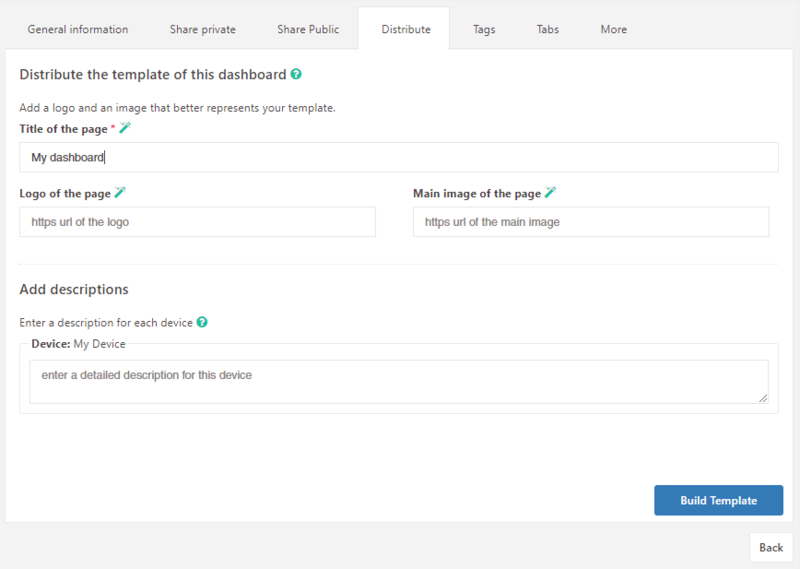 In order for you to build a template, you need to fill in all descriptions of the devices. 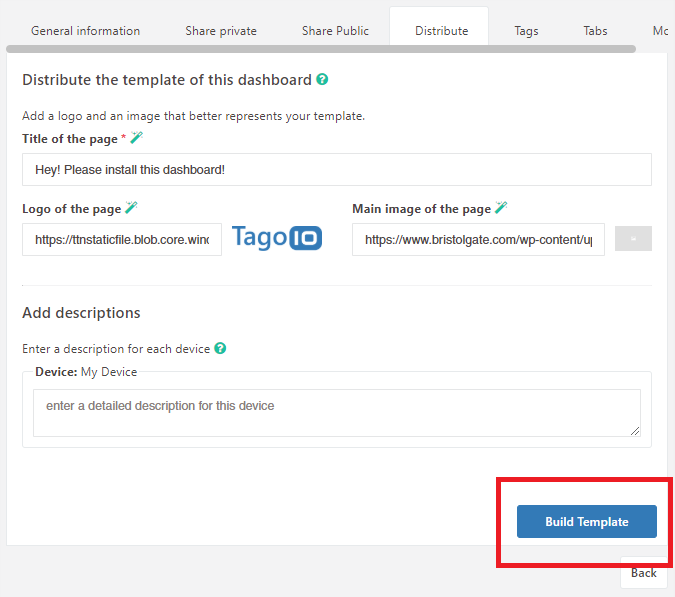 When you have made the adjustments, you can click the Build template button to save the information and build the page. 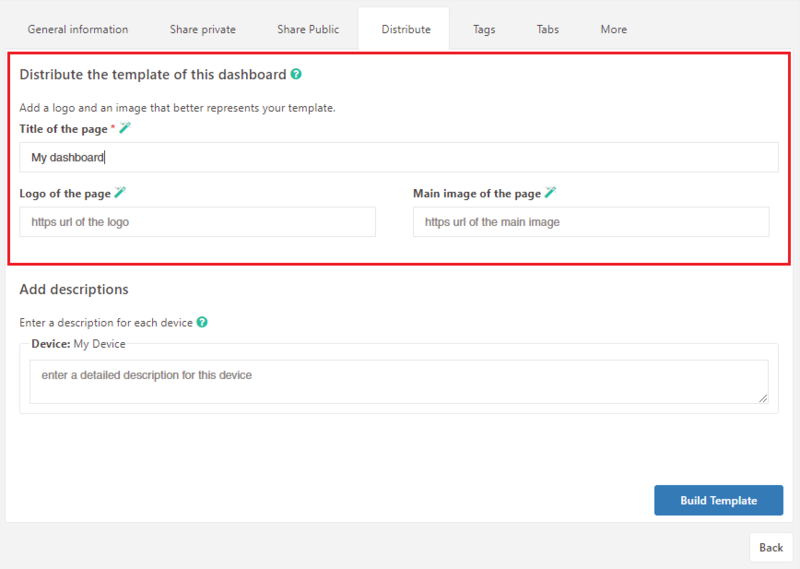 After you build your template for the very first time, a new section will show up in the page with the link to be shared with other users. All you have to do is click in the Copy button or manually copy the link and then distribute this link to anyone you would like. It is always a good idea to access the link yourself before sharing to check if the customized install page is up to your standards.